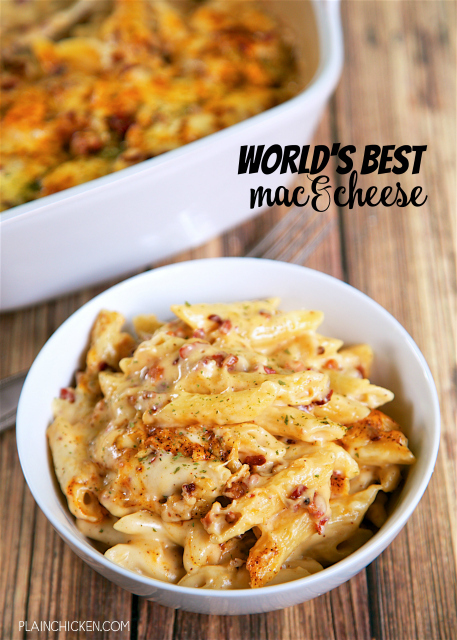 World's Best Mac and Cheese - so creamy, cheese and delicious! Just like the original at Beecher's in Seattle! Pasta tossed in a quick homemade cheese sauce with Jarlsberg and Jack cheese. We added pancetta - crazy good! Everyone cleaned their plate! Earlier this year we took a trip to Seattle for a few days. We had the best time! Seattle is a great town. I could totally live there. We spent the better part of our first day in town down at Pike Place Market. If you've never been to Pike Place Market, you must go. It is great. They have to most beautiful flowers that I've ever seen. There are also TONS of fun places to eat. We ate our way down the street and back up again. One of our favorite spots was Beecher. They make their own cheese and claim to have the best Mac & Cheese in the World. 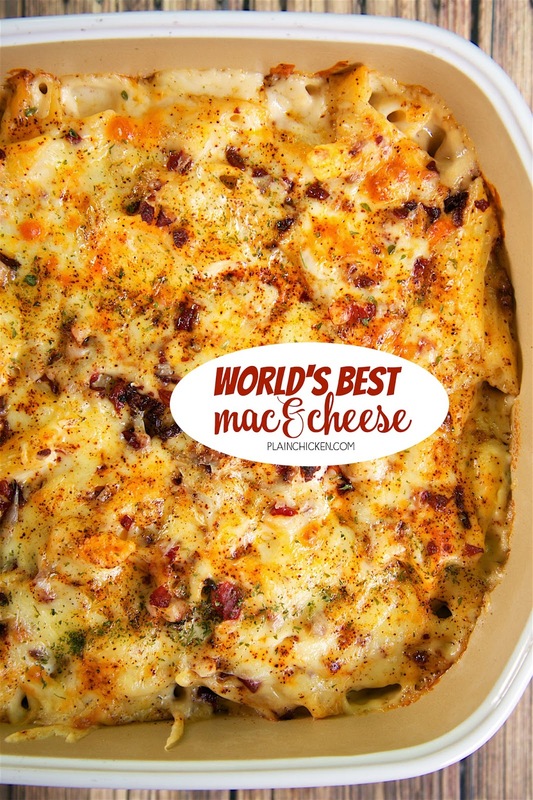 We couldn't pass up the chance to try the World's Best Mac & Cheese! The Mac & Cheese was really, really good. Super creamy and cheesy. We both really enjoyed it. I saw that they published the recipe on their website, so I whipped up a batch when we got home. I did make a couple of little changes. I didn't have the Beecher cheese, so I substituted Jarlsberg cheese. I also added some pancetta. We both LOVED this! Especially the yummy pancetta in the pasta. This can be served as a side dish or main dish. We ate it as a main dish with a side salad. SO good! Creamy, cheesy and delicious - just like the original. Preheat oven to 350ºF. Spray an 8x8-inch pan with cooking spray. Set aside. In a small skillet, cook pancetta until slightly crispy. Drain fat and set aside. In a large saucepan, melt butter and whisk in flour. Cook for 2 minutes. Slowly whisk in milk. Cook until the sauce thickens, about 10 minutes. Remove from heat. Add 1-3/4 cup Jarlsberg cheese, 1/4 cup Monterey Jack cheese, salt, 1/4 tsp chili powder and garlic powder. Stir until all cheese has melted. 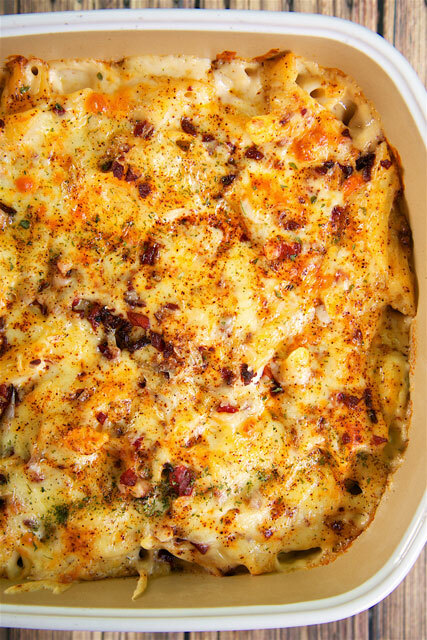 Combine cooked pasta, pancetta and cheese sauce. Spread into prepared pan. Top with remaining cheese and chili powder. Bake, uncovered, 20 minutes. Let stand 5 minutes before serving. Beecher's mac and cheese really is the absolute best!! I am DYING to try this and see how it measures up. I love that you added pancetta!! This looks delicious. But I have to tell you, when I go to your blog I get a pop up asking me to subscribe. I'm already a subscriber. The pop up has no "x" to get out of it, so I have to close the page and re-enter. This happens 3 times in a row and then finally I can see your post. BTW, it happens each time I visit. What is Jalsberg cheese and where would you find it?? It is a type of cheese - like cheddar, swiss, etc. I bought it at Publix. What is Jalsberg cheese and where would you find it?